After my recent review of TG660, Bangkok to Haneda on a Thai first class suite I thought I would point out a video I just uploaded to YouTube. If you are interested in what flying on the Thai 777-300ER in First is like, check it out! On my recent trip to Japan I took a domestic flight on ANA (All Nippon Airlines) between Tokyo's Haneda airport and Osaka Itami Airport. Here is a quick look at the journey! Electronic display/map showing the location of your flights departure gate! The lounge was really disappointing. There was basically zero food options and just some machine coffee and juices and similar. Very very poor as I had been hoping to have some breakfast. I really do appreciate the fabulous domestic lounges we have in Australia when I get to a lounge like this one. Needless to say I did not hang around for long and instead went back to the main terminal area and purchased a ham sandwich for breakfast. I went and sat around the gate area and noticed my flight today was being operated by a 777-200 in Star Alliance colour sceheme. Whilst I was waiting I saw a couple of ANA 787's, including this one which was being pushed back. This is my first ever sighting of a 787 in the flesh! Boarding was soon called and I made my way onboard with approximately 50 other passengers. I guess Sunday morning at 7am is not the most popular time for business travel on this route. I don't recall being on a more empty flight on an aircraft of this capacity. I estimate just 12% of the seats were taken. I immediately noticed the 10 abreast seating configuration which ANA use on their domestic 777s. I find it unacceptable on long haul but for this short flight it wasn't too bad. Particularly since the seat beside me was vacant. The menu was available in the seat pocket along with the inflight magazine. Overhead screens were showing some short programs but I didn't bother watching. Instead I spent my time looking at the passing scenery out the window. Ground Crew wave and also bow in Japan - very nice! Descent soon commenced and I had some amazing views of the concrete jungle that is OSAKA. I have never seen so much cement and buildings so close together. They really don't seem to have any large park areas at all, other than what you can see around the Osaka Castle. We had a nice smooth landing and headed to the gate. Being a domestic airport there was nothing but JAL and ANA tails to be seen. Many of them of course are wide bodies which are used frequently on domestic flights in Japan. I was soon out of my seat and heading down the jetway and on to baggage claim. 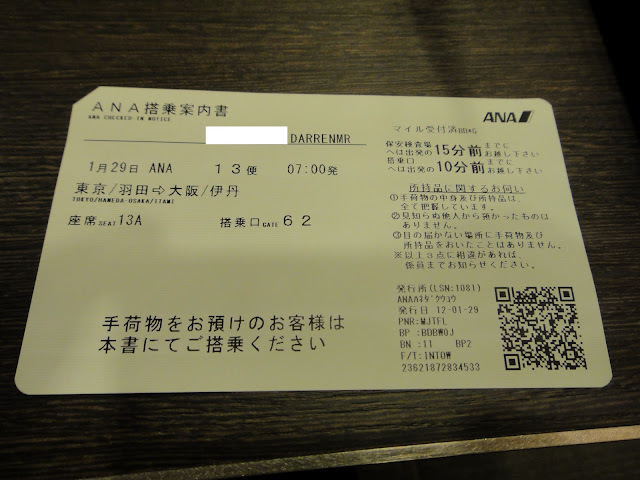 My first experience of Japan domestic travel left me feeling very underwhelmed. It's basically a low cost carrier shuttle flight with next to no frills. Still, it was very efficient and got me there in one piece and on time. I'd probably take the bullet train next time.